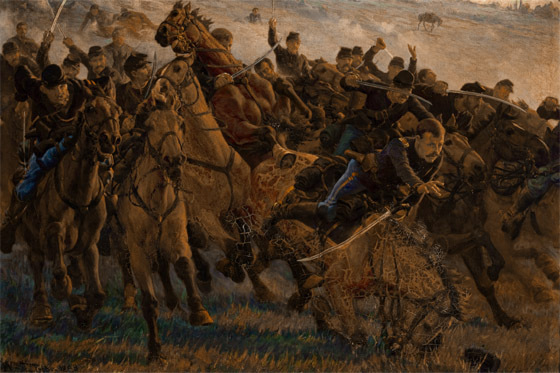 In the midst of a densely packed cavalry charge, Trego has inserted several of the most intense images to be found in any of his works. Slashing across the center of the painting in a broad diagonal stroke are three horses in extreme distress. Whether they have been shot or frightened by shell fire is uncertain, but their state of agitation has disastrous results for the men on and around them. One horse rears up in apparent agony to the very top of the image and seems about to fall on the alarmed cavalryman closest to it. Another horse directly in front of it appears similarly affected. Meanwhile, just below and in front of these horses, another horse is falling, throwing its rider. The hapless cavalryman seems about to fly out of the pictorial space, an effect unprecedented in Trego’s work. The painting has been in the family of the current owner for three generations. Philadelphia, 1895: Pennsylvania Academy of the Fine Arts . At some point in its history, the painting was removed from its original stretchers and reduced in size, perhaps to fit its current frame. It lost an inch off the top and bottom of the image as the canvas was wrapped around a new set of stretchers. Nevertheless, the painting is in basically sound condition but in need of cleaning and revarnishing.